Are you guys ready to do a time warp?! We ask, because like a blast from the past, the Dodge Challenger T/A has been revived and released this year. Available in three variations, the 2017 Dodge Challenger T/A is sure to bring with it some nostalgia and new tricks. Plus, Mopar got their hands on a couple 2017 Challenger models, and you know what that means – the 80th Anniversary model for Mopar is spoken for. 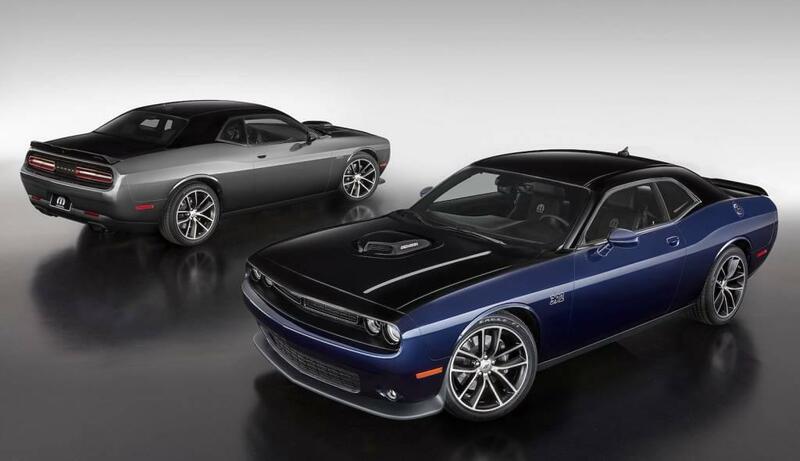 The three T/A models released are a Dodge Challenger T/A, Dodge Challenger T/A Plus, and Dodge Challenger T/A 392. All three models have a new hood outfitted with a massive center-mounted air scoop and air catcher headlamps. The latter allows air to pass through the headlamps, that then goes through a conical Mopar air filter before reaching the engine intake. These models also come with LED-illuminated T/A logos, a 2.75-inch electronically-controlled active performance exhaust system, and a performance kit. The kit includes a 0.5 inch lower suspension, Bilstein shocks, high-performance brake lining, a three-mode stability-control system, and high-performance tires. The base model of the T/A trims, the Dodge Challenger T/A is a souped-up version of its ancestor, whereas the T/A Plus will have a little extra luxury in the interior. To bring them into the modern age of muscle cars, a 5.7-liter V8 engine, capable of generating 375-horsepower, is found under the hood. The engine is paired to a six-speed manual transmission that can be traded out for an eight-speed automatic transmission. Riding on 20-inch forged-aluminum black Mopar wheels, the Dodge Challenger T/A and T/A Plus are just beginning to show the kind of power and handling the T/A series offers. Step back in time whenever entering the cabin, with houndstooth cloth inserts for the front seats in the Challenger T/A, and heated and ventilated leather buckets seats in the Challenger T/A Plus. The T/A Plus models also have a leather-wrapped steering wheel, an upgraded audio system, and the latest Uconnect 8.4 infotainment system with Apple CarPlay and Google Android Auto functionality. It’s safe to say the Challenger T/A 392 is the best of the three thus far. Powered by the same 6.4-liter V-8 engine found on the Dodge Challenger SRT 392, it gets up to 485-horsepower and sounds a whole lot meaner with the performance kit. The engine is also paired to a six-speed manual transmission with the option to switch to an eight-speed automatic transmission. The Dodge Challenger T/A 392 rides on 20-inch forged-aluminum black wheels, with Pirelli three-season performance tires. A more powerful engine and wider wheels aren’t the only addition though. Expect vented front brakes with six-piston Brembo front calipers and four-piston rears, a new suspension, “392” fender decals, and all the goods the T/A series has to offer. The 2017 Dodge Challenger T/A has a starting MSRP of $37,395; the 2017 Dodge Challenger T/A Plus starts at $40,195; and the 2017 Dodge Challenger T/A 392 starts at $44,995. Mopar is celebrating its 80th Anniversary this year, and when picking a car to ramp up, increasing the performance and value of the already worthwhile Dodge Challenger is the best choice they could make. The new limited edition Mopar ‘17 Dodge Challenger debuted at the 2017 Chicago Auto Show, and will surely disappear fast. The model is sure to be a collector’s item because production is limited to 160 units; 80 units have two-tone, hand-painted Billet Silver and Pitch Black, and another 80 have two-tone hand-painted Contusion Blue and Pitch Black. A special Mopar 392 logo will also be hand-painted on. Riding on 20-inch aluminum wheels with semi-gloss accents and Dodge logo hub caps, the finishing touches come straight from the Dodge Challenger SRT Hellcat. Oh yes, it’s true – the shaker hood scoop (also in pitch black), Mopar air catcher headlamps, and black exhaust tips can all be found on the Mopar ‘17 Dodge Challenger. Under the hood, drivers will find the 6.4-liter 392 HEMI engine, generating 485-horsepower and 475 lb.-ft. of torque. Also, since this is a Mopar vehicle, Mopar performance parts such as a cold air intake system, and strut tower braces and caps for increased rigidity and handling will be installed, along with four-piston Brembo brakes for absolute stopping power. Once inside, revel in Mopar-branded racings seats, tungsten trimmed with matching tungsten-color stitching. Under the hood and on the inside of the door lies an 80th anniversary badge that displays the production model number out of 80, since production is limited to 80 models of either Billet Silver or Contusion Blue.